Reminder: Bloody Mary contest at Pillow this Saturday! You Are Invited To A BLOODY BATTLE! WHEN: Saturday September 13th voting begins at 4pm ends at 9pm. Stop by just to vote or party all night! Winners will be posted for those who are unable to stay ’til the end. WHAT: A bloody mary contest with a winner determined via a blind popular vote. Mixes are labeled A-F. The voting populace purchases a “Flight” of Bloodies, voting on their favorite mix without knowing the bloody identity. Each constituent turns in their ballot for a discount on the first order of their favorite mix. We calculate votes and number of each bloody sold to determine the winner. We announce the winner and which mix is whose after voting ends. It will also be posted afterwards for those who have to leave before voting ends. In case of a tie there is a special judges panel. WHY: An ongoing battle to find the best bloody in Brooklyn! (aka The World!!) The Brooklyn Battle will culminate with all winners from each neighborhood competing for the Brooklyn Bloody Crown. Then it’s on to Manhattan… with a brief stop in Costa Rica. Judging from this new t-shirt, Madiba wishes it were named after another great half-rican. What must GhettoMetal sound like? Spotted on Dekalb and Adelphi. 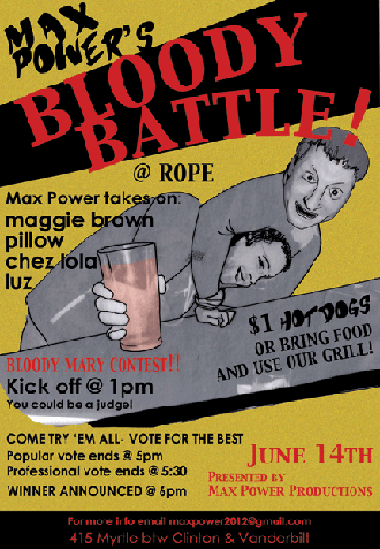 On June 14, our neighbor Max Power organized a Bloody Mary contest at Rope. Participating Myrtle Avenue establishments were: Maggie Brown, Chez Lola, Pillow Cafe and Luz. I missed it and I’m sure many of you did. Apparently Maggie Brown’s Bloody Mary prevailed, beating the runner up by a few votes. 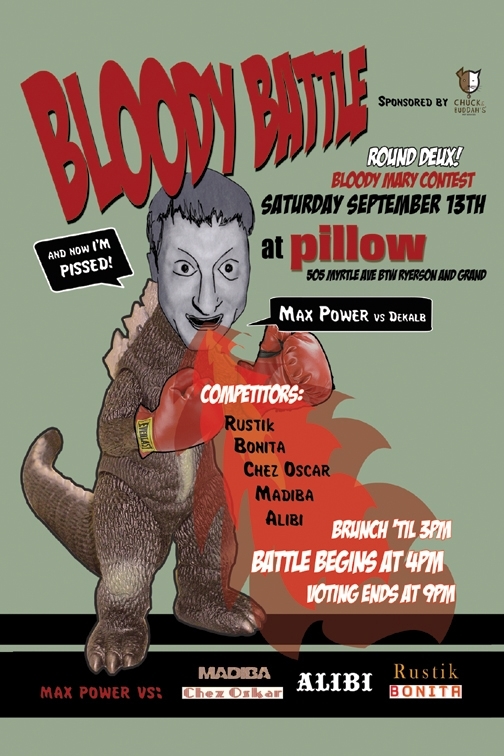 On September 13, Max Power strikes again with a Bloody Battle at Pillow, the cafe at 505 Myrtle. This time, Dekalb Avenue bloody maries come to Myrtle. Participating contestants include Rustik and the Alibi. A more complete list is a-coming. Save the date.